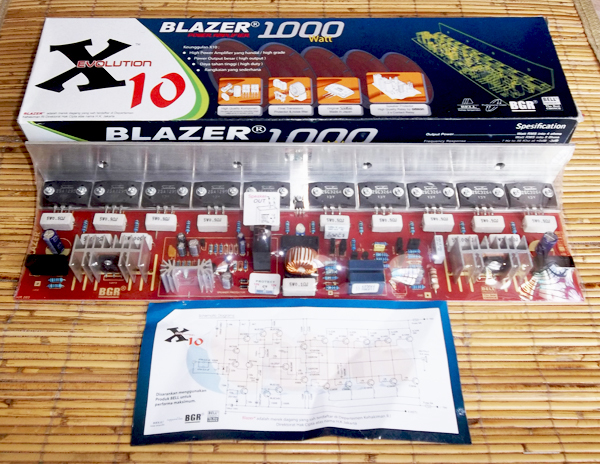 X10 Blazer 1000 Watt Power Amplifier accompanied by highly qualified components, consisting of 5 sets (10 pieces transistor) final transistor SANKEN original and charming using fiber PCB. Blazer X10 1000 Watt Power Amplifier is also equipped with a speakers protective circuit using OMRON relay, so you do not need to add speakers protector separately. This kit amplifier is compatible with source voltage about 20V up to 90V DC. But the recomended voltage power source is 75VDC with amperage rating 20A, it can give high performance into your speaker.